RTD representative, "Perris", holds a Governor Hickenlooper-signed Fairchance plaque at the recent April 11, 2018 Fairchance Symposium, co-presented by the U.S. Attorney's Office, Denver Workforce, and others. Executive Assistant U.S. Attorney, Chris Larson, presents at the April 11, 2018 Fairchance Symposium for Denver regional employers. Fairchance helps educate employers on subsidies and credits to help them hire at-risk candidates including U.S. Veterans, homeless, and justice-involved. Fairchance is a Colorado Charity that is partnered with CCP and the U.S. Attorney's Office in Denver. At our Sept 2017 event at University of Colorado, impact speakers were part of the symposium that presented to 50 employers, government-sponsored subsidies and incentives for Colorado employers to hire at-risk populations including U.S. Veterans, justice-involved, and extended-term unemployed job applicants. Jessica Larsen was one of several impact speakers. With a justice-involved past, Jessica was hired by Dependable Cleaners and is currently a highly-successful manager for the Colorado company. 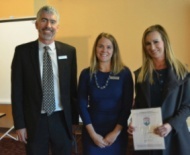 Pictured in this article: Jessica Larsen (holding the Governor Hickenlooper-signed award) and Sara Weiss and Matt Kirsch (both from the U.S. Attorney's Office) For more information on Fairchance or to get involved, please call (303) 287-6064.